For the Joy of Walking: Getting in Touch with your Inner Turtle! How do we find the time to do all that what we have to do? By zooming around in our cars. Well, for those prefer the slow lane, the good news is that by walking, you can do it all and much, much more. You make environmentally and fiscally sustainable choices. 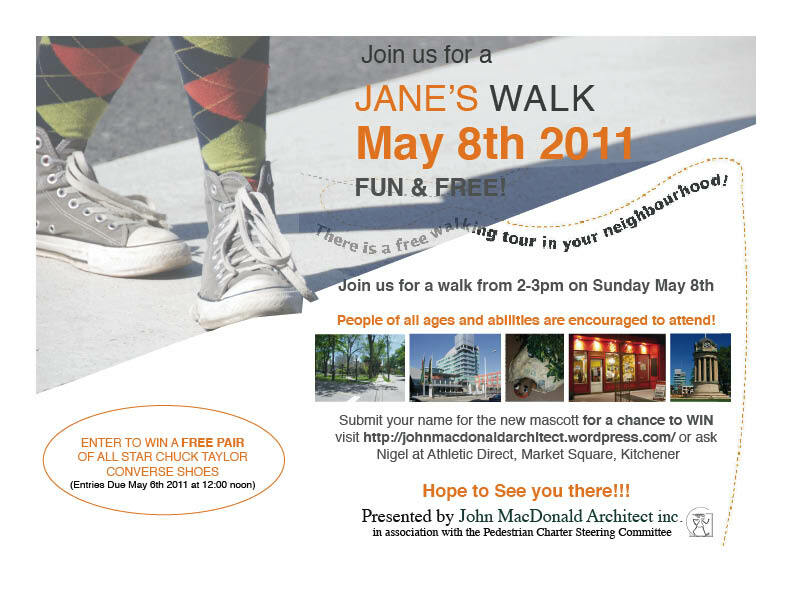 This year’s Jane’s Walk explores how the city environment and design can influence our travel choices, and hence influence the quality of life for all. This walk will be led by the turtle of the Pedestrian Charter Steering Committee, and by John MacDonald and Margaret Santos. John MacDonald Architect is a progressive architectural firm providing services that support the communities in which we live, through sustainable design, urban re-development and joint initiatives with groups such as the Pedestrian Charter and the Festival of Neighbourhoods. This walk will illustrate how walking can be the best option for getting around, and identifies how some relatively small changes to our public space can make it a lively and fun place to be for all, including people of all ages and abilities. Indeed, this could be the kind of transformation that can persuade us to walk, not just to accomplish our daily tasks, but also for the joy of walking. Meet us at Hibner Park at Ahrens Street West and Young Street and walk with us to the Clock Tower in Victoria Park. The walk is less than 1 km long. Oh! And about that turtle!? Stay tuned to this blog for further news! This entry was posted in Architecture, Community on 2011/04/15 by adminjma. Last week I was asked a simple question: What is your favourite building in the Region of Waterloo? Not so simple a question for someone who spends his life designing and constructing buildings, who has been trained to look at buildings with a critical eye, and who can never be satisfied with just picking one of anything. Nevertheless I took up the challenge willingly and was surprised at how easily an answer came to me. Last week I didn’t hesitate. I didn’t over think my decision. I didn’t second-guess myself. Last week I trusted my instincts. The Cambridge Library and Galleries’ Preston branch, also by Teeple Architects. Each of these buildings shares similar characteristics to one another, and to my choice of last week. Their architecture is influenced by, if not born out of their surrounding context. They share a common palette of materials: of concrete, brick, and stained wood. They are all of a human scale immediately relatable to the pedestrian. Additionally, each has created or engages with an exterior space. In the case of the above three, that exterior space is a public one. But, unlike my choice of last week, they are each public facilities that can be viewed from the street, visited, circumnavigated and explored. These are great buildings, so I suggest that you do just that. This entry was posted in Architecture, Community, Design on 2011/04/11 by adminjma.